We're back! We have been away upgrading the website to a new and improved platform. This time we have a bundle of news (freeview) and lots of updates to the subscription (paid) content. The government is consulting on imposing a CGT charge on non-residents, although according to the news today we already have the start of "overheating" in the residential property market. That problem is surely not going to get better now that pensioners can already cash in small pensions of up to £30,000 and from next year, may cash in their entire pot. Quite an interesting VAT case where it was claimed by HMRC that it has an "accelerated payment" solution which a taxpayer may use if he or she pays by direct debit but is unable to file their return on time. I can't find anything by that name online, and it does not come up in any search on HMRC site. In fact, I tried to pretend to be the taxpayer in the case to see if I could work out what I was meant to do. I found that there was very little help. I guess that you phone HMRC and then make payment using fast payments online banking. I would also guess that most taxpayer assume like the taxpayer in the reported case (see below) that HMRC takes payment in the normal way. Bit of a nasty trap. On a brighter note we have been updating many of our subscriber guides and this week we have the new 2014/15 Directors' tax planning toolkit. Follow the links below for summaries and briefings. HMRC has a created a new online "portlet" which from 6 April 2014 will allow employers to file their Employment Related Securities online. Importantly, employers are also required to register existing approved and unapproved share schemes. The CIOT alerts donors to the possible negative effect of the increase in the personal allowance; an unexpected income tax liability. MP's shocked over HMRC's abuse of powers MPs have been shocked to learn that officials at HMRC sanctioned the use of terrorism powers in order to track down Dave Hartnett’s whistleblower. Worryingly HMRC's head fails to assure MPs that HMRC will not misuse these powers again. VAT: late payment by DD not a reasonable excuse? In Gillens Limited v HMRC  TC 03406 a company was late in making its VAT payment having failed to allow time for a payment to clear. It did not know that HMRC provides an "accelerated payment solution" in these circumstances - we can't find that on HMRC's site either! In Susan Corbett v HMRC  TC 03435, a wife, who had apparently resigned from her husband’s business was still treated as an employee for the purposes of Capital Gains Tax (CGT) relief. In HMRC v The Executors of Lord Howard of Henderskelfe A3/2013/1568) the Court of Appeal has confirmed that a valuable painting was plant and therefore a wasting asset so that its sale proceeds were exempt from capital gains tax. This might also be an important result for capital allowances. Taxpayer asked to provide addresses on grounds of confidentiality but failed to avoid a penalty for non-disclosure because he did not explain why this was necessary at the outset. In Brimheath Developments Limited & Michael Victor Burgess v HMRC  TC 03438 the taxpayers failed to discharge the required burden of proof in connection with discovery assessments to demonstrate that they were unfair and were not based on inferences from the available evidence. In Roderick Thomas & Stuart Thomas v HMRC  TC 03412 the taxpayers attempted to prevent HMRC from proceeding in tax litigation on the grounds that it had “no reasonable prospect of success”. In Hossein Mehjoo v Harben Barker  EWCA Civ 358 the Court of Appeal held that an accountant was not negligent for failing to advise his non-dom client on the use of a tax planning scheme involving Bearer Warrent Shares. NEW: introducing the tax and NICs rules apply from 6 April 2014 which are designed to tackle tax avoidance when UK companies engage UK workers via offshore arrangements. Salaried members: when is a partner taxed as an employee? ESSENTIAL READING: if you are slightly baffled by the decision in the Dr Samadian doctor's travel case then start here and it will all become quite clear. We explain why the tribunal came to different decisions for the different journeys. What is the optimal monthly or weekly salary that can be paid by an employer without incurring a liability for the employer or employee for National Insurance (NICs)? What about the £2,000 NICs alllowance? What about annual payroll for RTI? The guide explores the tax-planning points and pitfalls of using dividends to create a tax-efficient pay package. UPDATE: don' forget to register at the start of the new tax year. NEW: this briefing note looks at the key features of the General Anti-Abuse Rule (GAAR) contained within the Finance Act 2013, what areas of tax it covers and what you need to know about the provisions it contains when considering tax planning. How to create a tax-efficient home office. Introducing the new measures introducing a new category of employee share owner are interesting for all sizes of companies. Our guide explains all. A summary of the new relief. You may also sign up for our new Masterclass. UPDATE: essential reading for directors. Will I save more tax if I trade through a company? Step-by-step guide to ensure Companies Act and tax compliance is met to allow a repayment to be treated as capital in the hands of the outgoing shareholder. UPDATE: the same rules apply to home working directors as other employees. However, a directors is more likely to be able to charge rent and there may be some additional issues and complications by virtue of their office. Can I charge my company rent for use of my home? 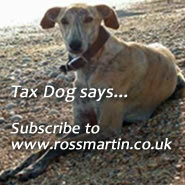 FULL access to www.rossmartin.co.uk : your firm's personal TAX INTRANET containing over 1,200 actively maintained tax guides, briefings, toolkits and checklists. Structured CPD: our detailed SME tax updates "for Advisers Only" provide topical summaries and planning notes. Nichola’s regular SME tax news web-update: we do the reading and cherry pick the best of the tax press, magazines and websites for you. A 20% discount on our Tax Masterclasses. You can also commission guides and checklists for your own practice, post comments and upload your own articles. Access to the Virtual Tax Partner ® service provides subscribers with FREE quick calls and a discount of on phone, email and tax support and mentoring.